Wes Anderson is a filmmaker who is certainly marching to the beat of his own cinematic drum. He's made a handful of films, none of which have been huge box office hits but which have made enough money to allow him to keep making more movies. He's been nominated twice for an Academy Award but never won. He adapted Roald Dahl's Fantastic Mr. Fox into a stop-motion feature a few years ago that is at once weird and wonderful (and has become one of my family's favorites). He also makes the occasional TV commercial, as well as dabbling in short films and, well, whatever else strikes his creative fancy. Much of his work is geared toward an adult audience, even while his subject matter often tackles family relationships, and in particular, relationships between parents and children. 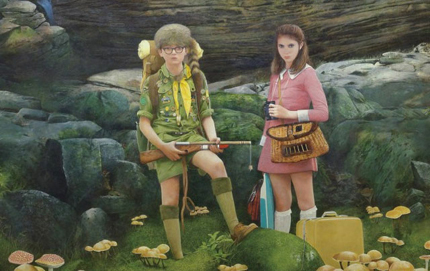 His latest film, Moonrise Kingdom, is a wonderfully wacky story about two star-crossed lovers who, at the ripe age of twelve, decide to run off together to escape the confines of their respectively dysfunctional families. The piece is set in 1965, in a New England island community that is about to be hit by a major hurricane. Sam (Jared Gilman) is surviving the summer at camp with the rest of his scout troop under the watchful eye of Scout Master Ward (Edward Norton), while Suzy (Kara Hayward) is unhappily wiling away the days at her lighthouse home with younger siblings and her attorney parents, Walt and Laura Bishop (Bill Murray and Frances McDormand). Their marriage is on the rocks, and Mrs. Bishop is having some sort of relationship with the local constable, Captain Sharp (Bruce Willis). Although the story is set in the sixties, Anderson also employs some rather retro film techniques throughout that help sell the proposition. The film's color palette is deliberate, and the musical score offers subtle reminders of a time now past. But the setting for the story is secondary to the story itself, one which is timeless and truthful, seamlessly mixing pain and laughter in a fable filled with reality and fabrication. The ensemble cast of characters stops just short of being caricatures, and the combination of their eccentricities somehow makes all their behavior seem plausible and appropriate. Sam is an orphan who has never been understood by his foster family and longs for a real family life. Suzy's family fails to understand her, and she finds herself wishing she was an orphan. Sam and Suzy happen to meet at a church play about Noah's Ark, and begin corresponding as pen pals. They plot to run away together, and meet on the appointed day to begin their trek to the far end of the island, unaware of the ensuing storms that will forever affect their lives -- both the hurricane and the tempest of emotions that erupts when the town discovers that they are missing. Sam uses his scouting skills to help them survive in the wilderness, and Suzy reads to him from books she has stolen from the library and plays classical music on a battery-powered record player. Their blissful days on the lam are numbered, however, once her parents involve the lonely sheriff, and then the chain-smoking scoutmaster joins the hunt. A woman known only as "Social Services" from the mainland also gets involved, and the race is on as the hurricane moves ever closer to their remote community. The premise may bother some -- this idea of two youngsters running off together, intending to get married and forsake their former lives. Although there is no gratuitous sexuality, there are a few moments of honest naiveté and exploration as these two children try to figure out how to be grownups. The film is no slam on families or morality, but rather a realistic reminder of how people often spend their fleeting childhood trying to escape into adulthood, an apparently magical world where age and size seem to offer unlimited freedom to do whatever you want, to be whomever you want to be. It also illustrates how many people suddenly find themselves decades into their adult lives, wondering how they've become trapped in a world they built, brick by brick, until it became a prison with no resemblance to the wide-open spaces they imagined as a child. Telling funny stories is hard work, and it is harder still to fuse funny with feeling, to move beyond comical and combine it with things you can truly care about. This refreshing independent little film is filled with goofiness and pathos, offering a slightly off-kilter look at people who live on an island, all the while reminding us that no man (or woman or child) is an island, and that all of our choices affect others' choices. And, like many of my favorite stories, it offers hope and redemption and reconciliation, if you can just weather the storm.